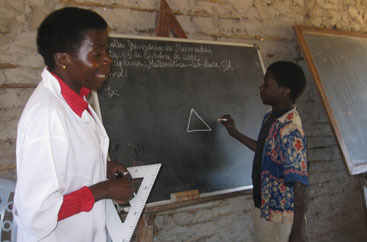 Within the program of improving the quality of education in Cabo Delgado, Mozambique, Humana Fundación Pueblo para Pueblo and its local partner ADPP-Mozambique have recently completed a project to adapt primary schools in the District of Quissanga, funded by the Spanish Agency for International Development Cooperation (AECID). The project included the improvement and refurbishment of the premises of five primary schools, by incorporating a warehouse, latrines for boys and girls, sports fields and orchard. It has also provided the distribution of educational materials for the school as for extracurricular activities, which include the so-called culture clubs, sewing and youth. We also have six preschools suitable for children aged 3-6 years. It has also conducted 12 sessions for 120 teachers teaching recycling in active districts of Ancuabe and Chiure well as another 50 from the five schools adequate. This has given continuity to the activities of the Teacher Training Colleges and its influence Bilibiza six surrounding districts.